Babies came too quickly and table was never completed. Yep, sometimes those ankle-biters just won’t let you live the dream of a NASCAR-inspired furniture lifestyle. Damn you meddling babies and your infantile ways! First tire – Rusty Wallace, Goodyear tire used in the 2004 Brickyard 400. Special 50 Years of Winning Logo. Purchased at the North Carolina Auto Racing Hall of Fame. One additional unmarked race tire, also purchased at the NC Auto Racing Hall of fame. 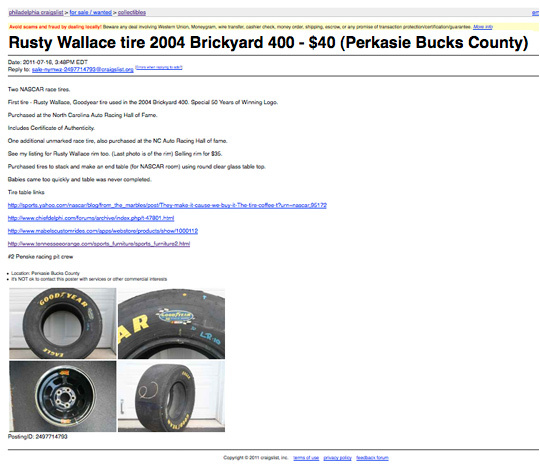 See my listing for Rusty Wallace rim too. (Last photo is of the rim) Selling rim for $35. Purchased tires to stack and make an end table (for NASCAR room) using round clear glass table top.